At Ghee Easy we are producing ghee under our own brand AND we do Private Label / White Label production for third parties. All ghee we make is strictly certified organic ghee. And, please understand: we make high quality-, good tasting ghee only. Always produced via heating (rather than via centrifugation). Our ghee can also be sold as private label organic clarified butter. 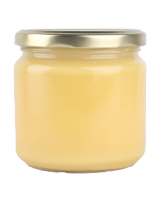 Our ghee can also be used as organic Anhydrous Milk Fat (AMF) in bakery, confectionery and ice cream manufacturing. We are flexible. We do small volumes for start-up like companies, we do big volumes for established players like big retailers, or well known superfood brands. In other words: we are flexible in using a rather small Minimun Order Quantity (MOQ). Meanwhile, we are equipped for producing big volumes if needed. We produce spiced ghee / herbal ghee to.